This data logger monitors voltage from 0 to 25V DC and can be connected to a variety of sensors enabling the logging of a wide range of processes. 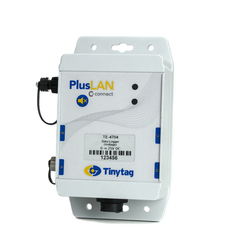 It plugs directly into a network point and sends data via the LAN for immediate viewing in the Tinytag Explorer Connect software. The logger is supplied with: a PoE injector, an RJ45 shroud and an input lead. Alternatively you can buy our 5-pin connector plug to connect to your own sensor.